With the launch of the major piece of the Affordable Care Act less than a month away, the Obama administration is escalating the public relations push with one of their most effective weapons – former President Bill Clinton, now known to many as explainer in chief. Speaking from his presidential library in Little Rock, Ark., this morning, Clinton led what amounted to a graduate seminar on the Affordable Care Act, webcast live for those who cared to watch, on how the law is supposed to work and why it's needed. One reason Clinton's assistance is needed is that, just weeks before enrollment starts for the new health care exchanges, the public remains not only highly divided over the law, but profoundly confused. "We've still got more than 40 percent of the American people who think that the law may have been repealed by the Congress or overturned by the Supreme Court or just don't know," says Drew Altman, president and CEO of the Kaiser Family Foundation. That group has been polling the public every month since the health bill became a law in 2010. Part of the confusion, Altman says, is because people have been "picking up a newspaper or turning on the TV or turning on the radio and hearing about yet another repeal vote in the House of Representatives." There have been 40 of those votes so far, which helps explain why so many think at least one might have resulted in the law actually getting repealed. But Altman says there are other reasons why he's not surprised that people are still confused, even at this late date. "How many people know how their own health insurance works?" Altman asks. "And how many people have waited to study for the exam just until they have to?" 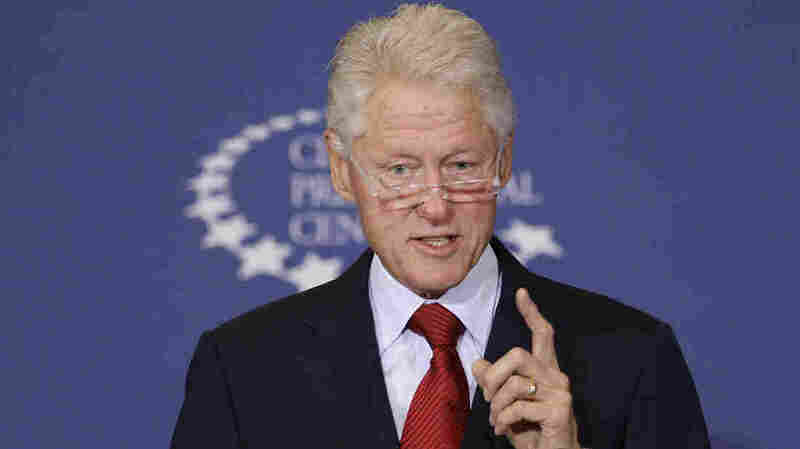 Which brings us to "Professor" Clinton and his explication of the act from Little Rock. Some of it was pretty dry. "Studies show that we are number one by a country mile in the percentage of our income we devote to health costs and ranked no better than 25th to 33rd in the health care outcomes we get," he said at one point. Some of it was aimed at making the political case for the measure. "This law has already done a lot of good," he told the invitation-only audience. "It's about to make 95 percent of us insured, with access to affordable care. It has built-in incentives to lower costs and improve quality." But the overarching theme of Clinton's speech seemed to be an effort to get Republicans to back off their opposition to the law, and work with Democrats to fix the parts that aren't working as anticipated. "We're gonna do better working together and learning together than we will trying over and over again to repeal the law or rooting for reform to fail and refusing to fix relatively simple matters," he said. And Clinton took a swipe — or two or three — at Republicans both in Congress and the states who are simply refusing to implement the law as written. "We've all got an interest in trying to faithfully execute the laws," he said. "If you get one of these elected jobs, you actually take an oath to do that." Republicans, however, aren't backing down as the clock ticks towards the October 1 launch date for the exchanges. "There's a sense of urgency from the Obama Administration right now, and that's what you see with Clinton and others coming out," said Dan Holler of Heritage Action for America, a conservative group working to defund the health care law. "Republicans in Congress need to have that same sense of urgency to say this is one of our last best shots to stop this law before it goes into effect." As to Clinton's entreaty for the parties to work together, Holler replied: "Obamacare is beyond repair. The only way to reverse the damage is to repeal the law in its entirety. Only then can Congress pursue meaningful reforms that put patients first." No word as to whether The Explainer will be making repeat appearances.